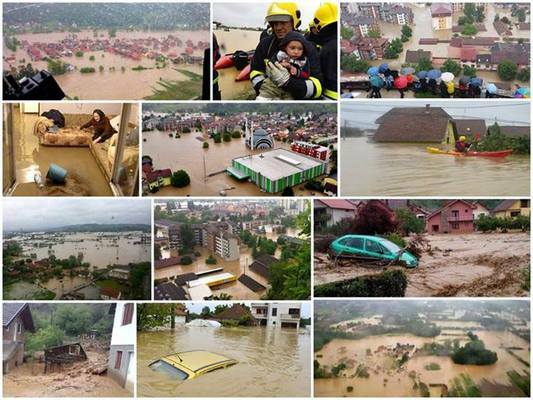 You may be aware that Serbia and the other Balkan countries are experiencing devastating flooding right now. It's the worst flooding the area has experienced in over 120 years. Writer, Traveler, Publisher, Deliberate Journeyer at GiveLiveExplore.com. TEDx speaker. Helping people escape into meaningful work at EscapeTheCity.org. You may be aware that Serbia and the other Balkan countries are experiencing devastating flooding right now. It's the worst flooding the area has experienced in over 120 years. There's massive destruction of streets, buildings and homes. The death toll is rising. Over 25,000 people have been evacuated from their homes, most of which have been destroyed. Those families are in desperate need of food, water, clothes, blankets, medication, or other necessities. It's also possible that you had no clue anything terrible was happening in Serbia. It's even possible you don't know where Serbia is (no, it's not Siberia, the really cold area in Northern Russia; Serbia is in Southeastern Europe). To be honest, if Serbia didn't mean so much to me, I probably wouldn't have paid much attention either. Here's the thing: I'm not Serbian. Nor do I live in Serbia. So why in the world do I care so much about Serbia? I first traveled to Belgrade, Serbia in 2012. Then again in 2013. And again in 2014, just a couple months ago. I've written about Serbia here on Huffington Post. I talked about Serbia and the friends I made there in my TEDx talk. I even fell in love in Serbia. So you might say I fell in love with Serbia. There are plenty of places in the world that need our help. And we hear about devastation daily. So why should we help Serbia? For those of us lucky enough to travel, there are certain places that touch our hearts in inexplicable ways. Sometimes it's the people. Sometimes it's the nature. Sometimes it's the circumstances upon which we've stumbled onto the place. Most likely, it's the combination of all of these and more. Even if we can't pinpoint exactly how or why these places touch us so, we can't shake them. They have a pull on us. Our eyes will forever twinkle when we talk about them. We become advocates for these places that illogically and unexpectedly barged into our lives. We become champions for these places that most people will never experience, for reasons that most people will never understand. We assume a heavy responsibility when this happens. Whether we want to accept it or not, we're forever indebted to these places. When this happens, it becomes our responsibility -- as the champions of certain places -- to raise awareness and create calls to action to help these places when they're in need. As travelers, we need to stand up and represent the locations that have given us the life-altering experiences that have shaped who we are and how we see the world. Serbia is that place for me. And today, Serbia is desperately in need. If people like us don't stand up for the places that touched them...who will? Local people will. Neighbors will. Expat and immigrant families living abroad probably will. But Serbia is not a rich country. A place like Serbia doesn't have nearly as robust a support system as the U.S. or other more developed countries. It needs help from elsewhere. It needs our help. The average income in Serbia is less than $10,000/year, yet I had to beg to pay for anything when with my Serbian friends. I see this as my chance to stand up, represent, and give back. To give back to a place that has already given me so much. It's important to help Serbia, but not merely just to help Serbia. We help Serbia because in doing so, we're making a much grander statement to the world. A statement of appreciation for the places that shape us. The most soulful of travelers know that traveling merely to take experiences is not the point. The point is to give as much as you take, when you can. Sometimes the currency exchanged is a life lesson. Sometimes it's an act of kindness. Sometimes it's friendship and sometimes it's love. And sometimes, it's physical currency. The importance of helping Serbia is the importance of helping all places that touch us. It's the importance of remembering, at the end of the day, we're all on the same team. It's the importance of recognizing that by paying homage to the places that impact us, we enable the cycle of giving and receiving to continue. And by doing so, we keep travel holy, meaningful, and as magical as it was the day we stumbled upon it. If a place has ever touched you the way Serbia has touched me, I think you'll understand the importance of helping Serbia. Of course, I urge you to help Serbia and the other Balkan countries if you can. At the very least, please share this article to create awareness. And even if you don't do that, please remember to stand up and champion for the places that shaped you in your journey. For more information on what you can do to help the people in Serbia and the other Balkan countries, please visit GiveLiveExplore.com.